(Hibiscus sp. 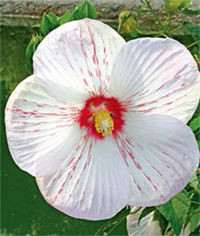 ‘Peppermint Flare’) A hard-to-beat, root hardy hibiscus with a bushy, 4’x4′ growth habit & a profusion of 9″ flowers that emerge light pink and age to white with wild red flecks throughout. 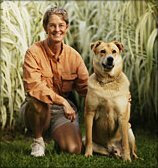 This tough, sun loving, pest resistant hibiscus blooms spring to fall! Look for the series of ‘Flare’ Hibiscus – easy care, gorgeous colors, & large flowers: ‘Pink Flare’, ‘Rose Flare’, ‘Pink Parasol Flare’, ‘Passion Pink Flare’, ‘Peppermint Flare’ & the original ‘Flare’!.